Taste the wonder of a simple and instant steamed South Indian food with less oil and no coconut chutney. Soak arhar dal for 15-20 minutes in water after washing thoroughly. Pressure cook dal and vegetables together adding salt and turmeric powder. Give one whistle and keep on low flame for 20 minutes. Soak tamarind ball in warm water for an hour and take out the pulp. Boil it for 15 minutes on low flame. Heat oil in a pan. Add hing, kalaunj, mustard seeds and fresh curry leaves. Add this tadka, boiled tamarind pulp and sambar powder in cooked dal. Give a boil on high flame and cook for 15-20 minutes on low flame. Dry roast rawa (suji), stirring frequently in a heavy bottom pan for 5 to 10 minutes on low flame. Cool it. add salt, coriander leaves, curd and water in it. Mix it properly. Heat one cup water in an idli maker. Rinse idli moulds. Don’t grease them with oil. Mix eno immediately before pouring the idli dough in the moulds. After adding eno, just mix all the things properly with the help of a serving spoon. Pour one tbsp idli batter in each mould. Place the idli stand inside the idli maker. Put the lid after removing the whistle. Steam them on a full flame till a boil comes. When the steam starts coming out of the maker, reduce the flame. Keep on low flame for 20-30 minutes. Turn off the gas and open the lid after giving a rest of five minutes. 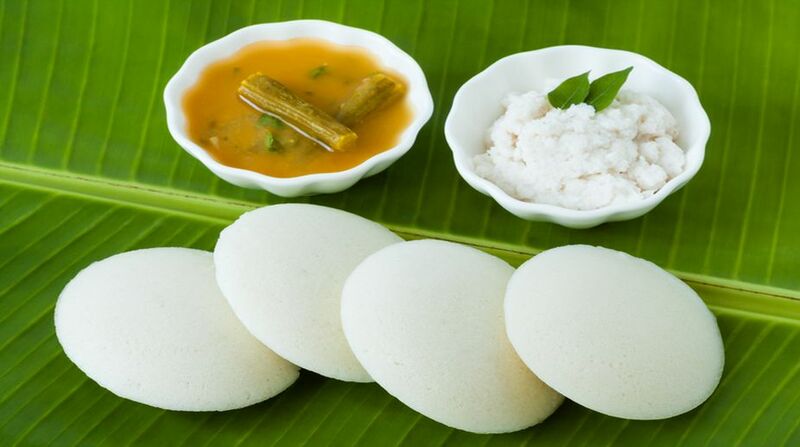 Take out the idlis with the help of a sharp knife. Serve steaming with boiling hot sambar and spicy coriander chutney. This is a simple and instant steamed South Indian food with less oil and no coconut chutney. The sambar (almost oil free) has the flavours of curry dal and is topped with nutritious Curry leaves. Serve it with fresh coriander chutney in place of coconut chutney to make it healthier.